We have a familial connection here – this camellia was bred by Mark’s father, Felix, and named for his mother – but that is not why it is a tried and true plant. It is the perfection of the bloom which is its appeal, along with a much higher degree of weather hardiness than most pale, formal camellias. The regular arrangement of the petals, in similar lay-out to a water lily with no central stamens visible, is what makes it fall under the classification of formal (these rules are written down, I tell you). The soft pink colouring is particularly pretty. When the blooms are spent, they fall to the ground rather than hanging on as brown mush – a characteristic which is called self grooming. Mimosa Jury has been around for some years now – there are established specimens locally in New Plymouth in St Mary’s Cathedral grounds. Left to its own devices, as has been the original plant behind our house, it grows tall and columnar, making an excellent hedger or accent plant. It also makes a brilliant clipped specimen. The neighbours have a perfect big lollipop Mimosa Jury as a feature. They have kept it tightly clipped and pinched out so that it is a solid ball of healthy foliage which will hold the perfect blooms out to display. 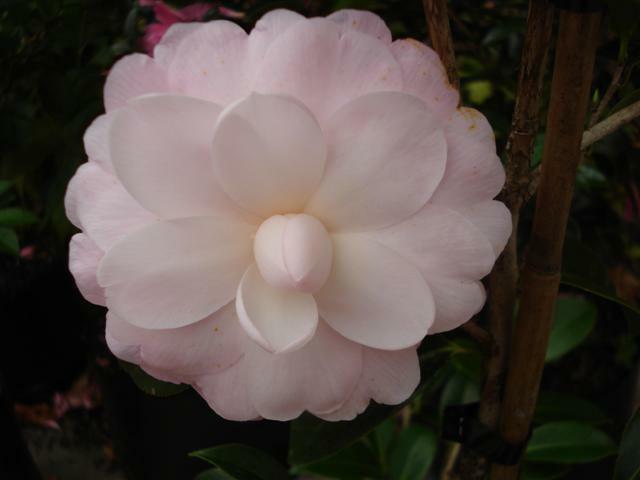 In our opinion, this camellia is probably the best that Felix named and it is no wonder that it has stayed so popular over a period of years. Other formal camellias have bigger blooms but usually sustain much more weather damage and do not have as many flowers over a period of many months. This entry was posted in Plant collector and tagged Camellia Mimosa Jury, formal camellia flowers, Jury camellias, New Zealand camellias, tried and true plants on 25 June 2010 by Abbie Jury.